Blacktrace Group designs, develops and manufactures cutting-edge technologies and products for many applications in chemistry, microfluidics, biology, nanomaterial sciences and more. We are driven by Productizing Science® – turning scientific discoveries into cutting-edge commercial products. Our success stems from world-class innovation and continuous development of new products and technologies. We employ a large team of world-class scientists and engineers, have state-of-the art testing and manufacturing facilities, and a broad knowledge of scientific markets. We are passionate about innovation and creating cool superior products which make a real difference to advancing science. We aim to deliver excellence in everything we do. Syrris develops the most advanced batch and continuous flow chemistry technologies for R&D Chemists around the world. Dolomite creates the coolest and most innovative microfluidic products. We have just released the worlds first commercially available 3D printer for fluidically sealed devices – an R&D 100 Award Finalist! Glass Solutions offers extremely high precision glass fabrication using excellence in glass blowing and microfabrication. Particle Works creates high-performance nano- and microstructured materials with precision control over particle size, shape and architecture. Dolomite Bio creates innovative products for high throughput single cell research, enabling rapid analysis of thousands or millions of individual cells and their biological products. We have offices in the USA, Japan, India and Brasil and over 40 distributors worldwide offering technical assistance and support. 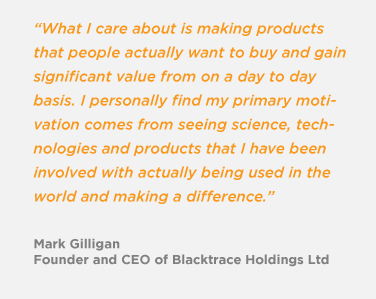 Since forming in 2001, the Blacktrace group has grown year on year and now has many thousands of customers in over 50 countries. Our customers include all the top 20 pharmaceutical companies, a wide range of major academic institutes, biotechs, start-ups, petrochemical companies, food and manufacturers, government institutes and virtually any company or organisation that involves science. Modular: One product range can suit a wide range of budgets and functionalities. Products can be easily changed day-to-day to perform different tasks and upgraded. Easy to use: Quick to set up and run. Innovative: Blacktrace’s products are specifically designed to maximize the benefits of novel science in a wide range of applications. Easy to automate and collect data: The majority of products sold by Blacktrace brands can be automated via proprietary software and control systems enabling effortless control and data collection. Scalable: Blacktrace’s products allow rapid research and optimization of microfluidic processes as well as scale-up to production e.g. a tonne per month of microfluidic droplets. For further information, please contact us now or visit one of our brand websites.